The site lies within the private property of an old finca in the Felanitx parish to the Southwest of the Island of Mallorca, about 3,5 km Southwest of Cas Concos des Cavaller. The path to the site consists of dirt and gravel tracks and a final 10 min walk. This relatively remote location is probably the reason for the lacking archaeological documentation and scientific awareness of this site. 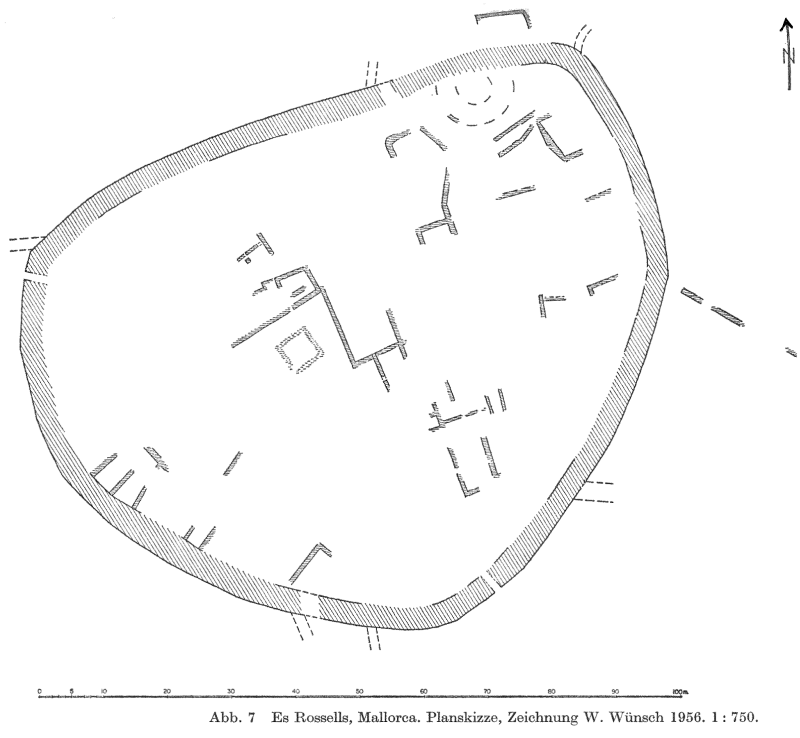 The site at Es Rossells was first surveyed in 1956 by collaborators of the German Archaeological Institute Madrid. A part of the wall was sketched and parts were photographically documented. The following illustration of this documentation consists of a short description and four photographs taken by Guillermo Rosselló Bordoy of the general site report (1962, 267-268). There is a further mention in an article about the Talaiot settlement of S'Illot written by the cooperation partners Otto-Hermann Frey and G. Rosselló Bordoy. Presented here are a revised plan and the elevation drawings of the wall as well as a short description of the context of documentation (1964, 68-71).Survey 1956 (Frey/Bordoy 1964, ill. 7). The Talaoit settlement of Es Rossells is unexplored which is a unique circumstance considering the size and preservation of the monument and the fact that it lies on a fully developed island. The project is planned for three years and its objective is, aside from the training of students, the documentation of materials and their conditions with the least possible intrusion on the vegetation. These are the specific objectives: (1) Tachymetric documentation of the outside wall including the inner edges in order to quantify the mass and determine the preservation conditions (Plan 2014). Photogrammetric documentation of the entire facade in order to analyse the design characteristics, stone works and sizes. (2) To clean and document the visible structures on the surface at the possible Talaiot to the Northeast of the settlement and its immediate vicinity. (3) A small sondage close to a recently located entry in the Northeast so as to clarify the stratigraphy on the outside of the wall, its fundamentation and in order to extract organic materials for radiocarbon dating. O.-H. Frey/G. Rosselló Bordoy, Eine Talayot-Siedelung bei S’Illot, Mallorca. Madrider Mitteilungen 5, 1964, 55–71. G. Rosselló Bordoy, Notas de arqueología de Cataluña y Balears. Ampurias 24, 1962, 267–268, 270 ill. 25, Taf. V.1–2.